SL Mahaweli Ministry, which is led by SL President Maithiripala Sirisena has recently sent a letter to the Planning Director of Batticaloa District secretariat claiming that there were 136 agricultural/farming [Sinhala] families residing in the past at Mayilaththamadu, which comes under Koa'ra'laip-pattu South (Kiraan) division of Batticaloa district. Between 2007 and 2014, at least 16,000 acres of lands in Paduvaankarai were illegally encroached by 300 Sinhala colonists from Polonnaruwa, the home district of SL President Maithiripala Sirisena. They went to the extent of constructing a Buddhist temple (hut). However, after protests the colonists were withdrawn towards the end of 2016. Now, Mahaweli Ministry is attempting to twist the old records to facilitate a fresh claim that there were Sinhala settlers in Paduvaankarai region of Batticaloa in the past, informed civil sources said. The appropriation of lands within the Batticaloa district started during the times of Rajapaksa, when Mr Sirisena was the Mahaweli minister. Armed Sinhala colonists started their encroachment after the end of the genocidal war on Eezham Tamils in 2007. 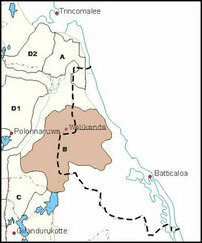 The first phase of Sinhala colonization came in the form as a big-scale seizure of pasturelands at Mayilaththa-madu and Maathava'nai, Koa'ra'laip-pattu South division. The region is known as Paduvaan-karai. Thousands of acres lands that have been traditionally used by Eezham Tamil dairy farmers as pasturelands for their cattle, were taken over by SL military-backed Sinhala ‘home guards’, who were converting the pasturelands into their farming lands. Between 2013 and 2016, more than 1,000 cows, owned by Tamil dairy farmers were and killed. The process was accelerated after Sirisena coming to power. Tamil farmers were assaulted by the home-guards and Forest Department guards. SL Forest Department was assisting the Sinhala colonization by filing cases under false charges against Tamil farmers. The Government Agent and others were tricked to remain silent and the extremist Buddhist monk from Batticaloa gained upper hand in an attempt to create a Sinhala Buddhist extremist colony. A number of huts put up by the intruding Sinhala were dismantled. However, the colonists were constantly wandering around the abandoned structures for some months. In the meantime, SL Forest Department and Mahaweli Authority are trying to demarcate a large section of the pasturelands as lands coming under their domain, Tamil farmers in Batticaloa complain. Colombo-centric SL system is taking over the lands using the various ‘civil’ Acts and clauses of the unitary SL constitution before any political solution is achieved to the national question of Eezham Tamils. There would be no political solution possible once all the lands are gone, commented Tamil political observers in the East.